Hyperkin's RetroN 5 console is a fantastic way to enjoy old classics, and offers plenty of benefits over existing clone retro systems, largely because it uses advanced software emulation to offer HD visuals and other benefits. However, it would appear that Hyperkin can't entirely take credit for the system's impressive credentials. We've been contacted by Daniel De Matteis, a key member of the RetroArch team, who claims that the RetroN 5 uses several emulators without permission. In case you were wondering, RetroArch is an open-source "all in one" emulation solution which is currently available for free on a wide range of platforms, including Android, Linux and Windows. It unifies the work of several different emulator authors — who produce "emulation cores" which are used in the program itself — into a single user interface, and is famed for its accuracy. 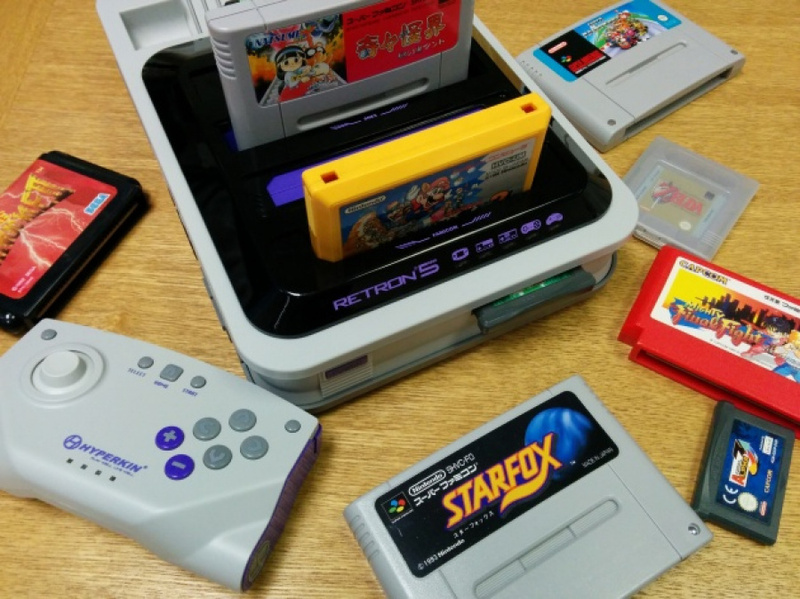 It is claimed that by using RetroArch, the RetroN 5 infringes on the rights of several authors, including Eke-Eke (Genesis Plus GX), SNES9x (a non-commercial emulation core) and RetroArch itself, which is licensed under the GPLv3, meaning that it is forbidden to use it in a device that forces hardware restrictions — which is exactly what the RetroN 5 happens to be. De Matteis and his team have run comparisons to check the similarity in code between the aforementioned emulators and what is installed on the RetroN 5, and it would appear that the code is near-identical. De Matteis reveals that he personally authored some special code for the SNES9x Next emulator and the code found in the RetroN 5 "seems to be verbatim, line-by-line, the same". We're just a bunch of lone individuals with no real financial muscle or legal muscle so they will be undoubtedly in an advantage there but all the same I'm not thinking of just letting this go unanswered. At the very least some accreditation of some sort should have happened and they should have honored the licenses of the emulators they used (like the SNES core forbids it from being used commercially). We didn't receive any patches either by these Hyperkin guys which is a base requirement of GPL code - that code of derivative works get shared back. We've contacted Hyperkin for comment and will update this story when we hear back. The people who allow games to be stolen complain that their own work has been stolen? @Bass_X0 Exactly what I thought. It's hilarious to see the creators of emulators complain about their work being stolen. Writing an emulator is not a crime, and it is 100% new software. @Bass_X0 @KeeperBvK Creating an emulator is not a crime, it's an original piece of programming which is actually a very impressive act, when you think about it. And you've totally missed the point there - the people who create these emulators don't charge money for them, they're non-commercial (often open-source) pieces of work, and by placing them inside a console, Hyperkin is going against that. Emulators aren't a threat. Its when you use them to get games illegally. @KeeperBvK @Bass_X0 Have either of you tried righting/coding anything as an emulator would take time and effort and they are not making money on it either. I am well aware of emulators not being illegal and I can imagine it being a lot of work. But that's not the point. Having to put work into anything certainly doesn't make it better. I would imagine planning and pulling off a bank heist would be quite a lot of work, too, but so what? And emulators for platforms like the NES, SNES, Mega Drive or whatnot might not be illegal per se, but it is obvious that they are used for illegal actions well over 99% of the time. These guys behind those emulators are well aware of that as well or if not, then they should be. How about another analogy? I create a powerful weapon (the emulator) that can also be used as a can opener (the legal options it provides, yet nearly nobody uses). I only construct the weapon, but I don't manufacture any ammunition (the roms) for it, despite this ammunition being really easy to come by for anyone. Does that mean I can wash my hands in innocence? Certainly not. @Damo I was thinking the same thing as @Bass_X0, but you've brought up a great point there. I totally want one of these Retron 5's! This isn't that different from phones being sold with the Linux kernel in it IMO. Although in this case I'd argue it's less of a deal than that. Because while it might not be "illegal" to make an emulator there aren't really any legitimate ways to use an emulator outside of a device like the one here. So I don't really see what the problem is. I think comparing an emulator to a 'powerful weapon' is not a strong enough example. An emulator is more like making a device that would allow someone to blow up a planet. I was waiting for something like this to happen eventually. Most emulators have their code as open source, but open source doesn't mean you can slap it anywhere and not credit an sometimes compensate the original author. I can only assume this is the first steps in a long, long legal battle for both parties. @Shiryu All you have to do is release the source code and the signing keys for GPLv3 stuff and not use none commercial use only stuff at all. The same thing that stops this thing being preloaded with a stack of Nintendo and Sega ROMS also protects these emulators unless the conditions as met. The issue is they took the code without complying with terms of the license it was released under. The specific violation is probably that GPLv3 specifically prevents "tivozation" of GPL code. That is preventing users from modifying the code on the device. GPLv3 came about specifically because of this issue and because of the Microsoft-Novell deal. Edit: I really shouldn't post something when I just woke up. @unrandomsam I still don't have a RetroN5 and this.... this makes me wonder if I will ever get one. The good thing that came out of all of this is that even if I am a huge retro gamer and emulation enthusiast, I was unaware of the Retro Arch project. I have been reading up on their page and am quite looking forward to become one of their satisfied users. Will test their latest package today on Wii and Android. if RetroArch is an open source program why would hyperkin need permission? Considering buying one. Can I import it to Ireland? The issue is that the RetroArch creator (and other emulator makers) are not being credited for making the software that the machine uses, which Hyperkin is currently taking full credit for. It's not a legal matter (yet) or a financial matter, it's about principal. While I understand that emulation in and of itself isn't piracy, it is generally necessary for piracy to occur, and its primary use is typically piracy. For this reason, it's ironic that the same people who created the tools for thousands, perhaps millions, of people to steal games are now complaining that those tools were stolen, especially since the people who stole them are using them to let people play games legitimately. Oh no, did they really? That's terrible form, RetroN. @BarryDunne Sure, try FunStock, they're based in the UK. LOL That is absolutely ridiculous! You can't legally make money off emulators and they are for the sole purpose of playing games without paying publishers and developers for them so they have no right to complain! Honestly, I don't see how these types of consoles are even legal. When I want to emulate my childhood, I do it the old fashioned way. Dust off an NES and blow into a cartridge. Well, it is only fair for the coders to get credit for their hard work. That's not too much to ask. I mean, credit where credit is due. Hyperkin is awful. Terrible build quality and lack of consumer service. I wouldnt touch the Retron 5 with a 10-foot pole. That aside, whatever your views on the ethics of emulation are, the original coders still deserve to be credited. That's nice and all, but unfortunately not everyone whose interested in those games can do that especially as time continues to go on. Fortunately there's Nintendo's Virtual Console and Sony's PSOne Classics (also the PSP games they have available for the Vita to emulate), but there's the issue of pricing that makes people turn to free emulation rather than paid. @AVahne well they can try ebay. amazon. craigslist. etc... also there are numerous momnpop used game stores across the country that would love the business. Just because I can't afford to go to the movies doesn't excuse one for hitting up free downloads.I actually bought that dusty old nes on amazon and like 20 games for way under 100$. The coders don't want credit they want sourcecode and the ability to build modified versions that is why they used GPLv3. The authors of snes9x don't want it used commercially that is why they used that license. (And why no copyrights were ever transferred on contributions which the only way you can relicense something like that on commercial terms - other than contacting every contributor). They can use bsnes if they comply with the license. (And it is the best emulator anyway). True, but for some people there's the issue of limited space to be putting things like old consoles. Also, your movie analogy works more on newer games rather than old ones. Say there's an old movie you'd like to watch, but no one sells the old copy anymore and there hasn't been a rerelease, nor do any of the streaming services have it. Will you just simply give up, even though the people who originally made money off it stopped doing so many years ago. It still doesn't make emulation totally alright, but in certain circumstances its a way for certain people to experience certain games that they never would be able to without it. @CanisWolfred Either copyright infringement is ok or it isn't. This is wrong for the same reason distributing rom's is and because of the same laws. They don't follow the license they have no right to redistribute (Exactly the same as people putting up rom's to download without permission). @AVahne storage bins. For like $5 you get this big bin with a convenient lid that opens and closes and it can safely store all sorts of useful things. Holiday decorations, old sweaters, guest linen, and even video games and consoles. Don't see why people think complaining that your work is being used without permission is wrong, regardless of the work's practicalities. If you drew a picture and I traced it, don't you think I should at least credit you for the original drawing I based mine off of? The emulators are protected by GPL, Hyperkin should've honored the terms provided by each emulator's license. It's not about whether the emulators are used for illegal activities or not, it's about fair use. If you think the developers have no right to be asked for permission for use their work and credited, then you're just being bloody unreasonable. I think this can be straightened out. In a firmware update, give credit to and ask permission of the emulator devs, use a different Snes emulator, and make the Retron5 OS open source and modable. "You've stolen our theft software!" I have no sympathy for for either side. There is a fantastic NES puzzle game called Fire n' Ice. It costs $100 for a cartidge used. It's not on the Virtual Console on any Nintendo system. Downloading this old game isn't stealing from anyone. Is it "illegal?" Yes, but I don't see it as unethical at all. Emulation makes it possible to play these games that have been lost and forgotten. And to play games that you have legitimately backed up, yourself. It's not theft software. @Danrenfroe2016 Making emulators takes a lot of work, so when another company is profiting by copying and pasting your code, you deserve to be credited, period. There are many legitimate uses for emulation. @NTELLIGENTMAN Thank goodness you don't run the world, then. Philips, Sony, and Toshiba, and Panasonic created the DVD format. Why are other companies allowed to create software and hardware that reads DVDs?? @Sforzando i agree to a point about code and software in general, but I have never agreed with making emulators for a product that was closed source by design... Nintendo's hardware was made by Nintendo for its purpose of selling software to make a profit. Everyone always likes to walk all over the companies that actually make and designed the device. How about a subscription service similar to Pandora or Netflix? Let's call this fictional service NESflix. For, say, $5 a month, you get access to a vast library of NES, SNES, Genesis, etc games, which you can play on any console, computer, or tablet. Ideally, all publishers would come to agreements and each console's entire library would be available. At the least the library would have to be better than the VC. emulation is awesome. where else can you play dk64 with a ps3 controller? Yeah this will go real far. Having been talking to their head tech the last few months I kind of find it very hard to believe he's a code thief. I remember awhile back talking about how they did all this, and he said that it was a mix of in house and also using public sources that were not limited by some form of license and even then that code was analyzed and adapted to their own. What you have here most likely is a derivative piece of work, kind of like where you can go so far making a copy of a popular item, but not so closely it's stealing. Or better yet, the classic Nintendo vs Tengen lawsuit where Tengen smoked them for breaking their 10NES chip open and making a work around chip to defeat it to sell games. They reverse engineered the code and made their own, which is what this thing is doing from what I've gathered. An emulator is a really complicated and powerful program. Have you ever made one? An emulator itself is not stealing, but this is. So shut up. If it's open then ANYBODY can use it. If they didn't want this to happen they should registered and patented instead of being pseudo-anarchists geeks crying for attention. Wow, it amazes me how many people here don't understand licensing in the slightest. When almost any software is released, it's released under a license (You know, those things you agree to without reading every time you install a program on your computer?). If software is released under an Open Source license like the GPLv3, it doesn't mean that anybody can take that code and use it however they want without giving credit. It means that people are allowed to look at the source code and if they want to, they can change it to fit their needs. In the GPLv3's case, like mentioned above, it's actually a legal requirement of the license that you have to give away any changes you made to the code. There are licenses that allow you to do whatever you damn well please with the code, such as the Creative Commons license, and the Public Domain, but that's not what's being used here. Open Source licenses can be held up in a court of law, so for people like @minotaurgamer , you might want to recheck your facts. The creators of these emulators are completely in the right here. Hyperkin really screwed up by stealing this code. @Shiryu I can't imagine them having a legal battle when the team behind the actual code doesn't seem keen on suing. It just looks like they are annoyed their work is being used without crediting the original author. @Kasplat Bad faith from Hyperkin. Will wait for their response. As of right now, I'm not too keen on purchasing one.... and that's the first timeI say that ever since they announced the thing. @NTELLIGENTMAN: Currently, emulators are fine legally, as long as the code does not contain any part of the original system's bios code. The only one I feel bad is Eke-Eke, I have been following his work since the TehSkeen days, i still remember the first release of Game Cube Genesis Plus GX, he put a lotta work into it. @minotaurgamer, Yes, it's all open source, Genesis Plus GX itself is a open source. @Todd102030 Very few open source licenses forbid commercial use of the code. I totally understand that, but they require that the user of the software credits them, and if they make any changes to the code, like they did, they have to freely publish those changes, which they didn't. So it infringes on the rights of multiple jerks that infringe on Nintendo's copyright and enable other jerks to use their stolen copies of games... so? Go RetroN! Those still take up space too though, which can be a problem for dorms, apartments, and other small spaces. Games take up a surpring amount of space as well. Found that out when I moved and what I thought was a "small" collection took 2-3 boxes by itself. Plus, having a small, semi-permanent home makes one think about this stuff. Emulators don't infringe on copy-right, thats why they're considered legal in the first place. They aren't responsible for what other people do with their software either, thats like saying a brewery is responsible for under-age drinking. You can't control what the end-user does with your product. As far as the industry is concerned, used games are as bad as piracy, so by their logic those legally bought 10-20 year old games are "stolen" too. Games they don't profit from either way, so the only "legal" way of playing their games would be the VC, PSN, GOG, ect. Legal doesn't always equal moral, the world isn't that black and white. Thats why you have 'hard questions'. A lot of very dismissive comments against emulation and ignorant of licensing. As zombie_barioth said, many in the industry have a problem with used games as well. People scoff at the existence of emulators, but big game companies use emulation all the time. Nintendo's Virtual Console services are emulation. Retro game collections are emulation. Sega has worked with the author of Kega Fusion in the past because he managed to get the sound emulation right. There are problems with retro collections and services, such as lack of options, forced filters, poor emulation, unwanted changes. Games disappear without warning from services. Emulation also preserves the ability to play great games that were never ported from the arcade and will likely never appear on any retro collection or download service. To begin with that's not the point here. You cannot steal someone else's work and make money off of it. That doesn't change even for emulators. You can't justify a wrong with a wrong nor dismiss it because you feel it is wrong. The author's of the emulators have every right to be credited for their work. Secondly the percentage you gave for emulation is completely wrong. It's not ''used for illegal actions well over 99% of the time". Aside from the fact that there are people out there that want to play games they own on other devices for various reasons (i.e original game's battery is dead, unreadable, more convenient, etc) game companies also do emulation on their own to continue to sell their older games. Emulation isn't something wrong either, in many cases such as the Retron the gaming experience is also improved. As this article points out the games have HD visuals. The issue is RetroN5 is being sold, which is a violation of the non commercial use of the emulator technology. It's obvious what needs to be done - RetroN5 is now free. The easiest way to resolve this issue for Hyperkin is probably to release the source code and encryption codes to the people who bought the Retron 5 (they don't need to put it on the internet, it is probably okay if consumers can request this from them). However, that would allow more technical owners of the device to modify it in such a way that it can load roms, which is currently being protected by the encryption keys held by Hyperkin. Releasing them is probably not that bad for Hyperkin, because someone who wants to pirate games can buy cheaper and better available devices anyway. Also, I don't see why they would ever care about having the cartridge slots. If they want to be able to keep the encryption keys on the device, they should only use emulators licensed using the GPLv2 instead of the GPLv3. A side note: remarks such as "the emulator authors claim their work is stolen" are really weird, as the GPL implies they don't have any issue with the fact that Hyperkin copied their code and put it on a device being sold commercially. They do have an issue with the fact that Hyperkin does not allow the consumers who buy the Retron 5 to freely modify and change the software running on the device. Basically, the GPL states that you can do anything with a piece of software (copy it, give it to other people, modify it, put it on a commercially sold device), as long as you give the same freedom to the people you redistribute it to. @blikmansch Even doing that still leaves them without a SNES emulator. Only way to get the none commercial use changed from the snes9x license would be to get every single contributor to agree. A lot of the people commenting are against emulators. They argue that you can just play on original hardware and that doing otherwise is stealing. I have an original NES and a library of 60+ games. I want to play these games and not have them look terrible. Playing NES on an HDTV makes the games look terrible and play terrible as a result of input lag. The ONLY way to play these old games on an HDTV (LCD, plasma or whatever) is to use an emulator, unless you want to shell out like $400 for a fancy upscaler and then also mod your consoles to output RGB - oh yeah, this won't solve your input lag issue though and will actually add lag. The "newest" CRTs are now 10+ years old and will not last much longer, and most are in poor condition and have noticeable issues with geometry, purity and convergence (look it up). I repeat: emulators are the only way to play these games on an HDTV and have them look right and play correctly. I only have ROMs of games that I own. I realize that under the law I would have to create the ROMs myself, but come on. Now we're just getting into ridiculous technicalities that are designed purely to benefit the copyright owner by turning the copyright into an endless source of revenue, something that copyrights were NEVER intended to do (again, look it up). To illustrate the absurdity of copyright laws as applied to old video games, it is actually legal to make a backup copy of your software under a provision of the DMCA, but game copying devices are themselves illegal. @CanisWolfred @KeeperBvK @FullbringIchigo @Zobocop Blaming the developer of an emulator for the piracy it's used for is like blaming a factory that makes guns for the violence their product causes. Hyperkin is in the wrong, and it show just how shadey a company they are when they steal and don't tell anyone until someone disassembled their code and finds bits and pieces of something they or their colleagues wrote. The fact that they didn't ask for permission to use the code in their commercial product when the licensing is designed to prevent that is disgusting, and is disrespectful to the people who wrote the code your product is running on, it's like biting the hand that feeds you in a sense. It's even worse because the program encryption keys prevent you from using this software in the way it was intended. I.E. If they wanted to make the RetroN 5 play cartridges, thats fine, but preventing users from using it to play roms is wrong because it hinders the freedom of the end users, freedom they would have had by using the open source parts of the software on another platform and thats the big issue. If Hyperkin truly wants to damage control this, they need to release ALL of the RetroN 5 code and allow the end users to use roms if they so choose.